There’s nothing particularly pleasant about diaper duty — no matter how cute your baby’s little bottom is… but these all natural diaper creams sweeten the ordeal with their healing, therapeutic properties — and their ability to reach far beyond the changing table to provide nourishment and tender loving care to babies and the entire family. Read after the jump to learn about our top 5 picks for the best all natural diaper creams! Earth Mama Angel Baby organic products boast the unbeatable safety rating of zero on The Environmental Working Group’s Skin Deep website — which rates personal care products with regard to their toxicity levels. The extensive collection of Earth Mama Angel Baby’s completely pure and non-toxic products includes this gem of a diaper cream: Angel Baby Bottom Balm. 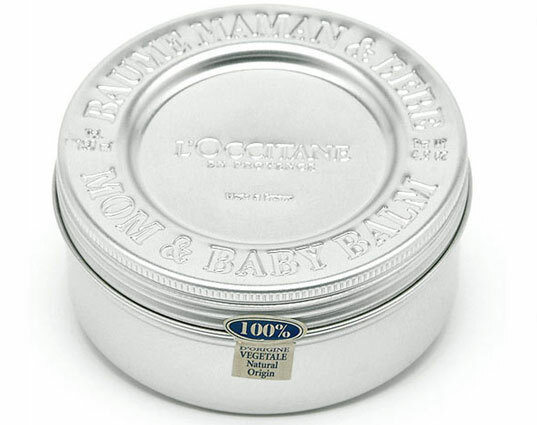 This vegan salve is made with “organic olive oil infused with a proprietary blend of naturally antibacterial and antifungal organic herbs, shea butter and pure essential oils.” In addition to being used to protect and treat against diaper rash, this amazing balm may be used to soothe cradle cap, bug bites, scrapes and chicken pox, minor rashes and burns. + Angel Baby Bottom Balm $9.95/1 oz. $14.95/2 oz. 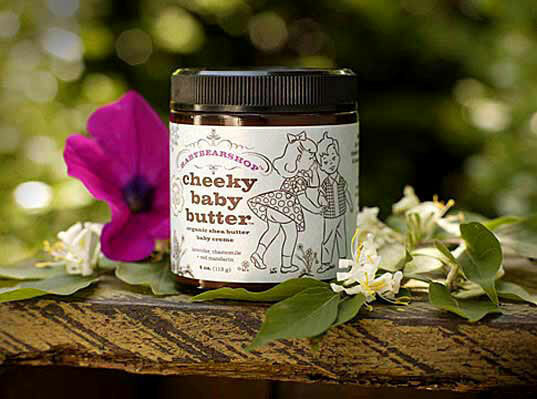 BABYBEARSHOP’s Cheeky Baby Butter is 99% organic, 100% natural and made from 100% plant derived ingredients including nourishing shea butter and soothing lavender oil. Containing no parabens or artificial ingredients, Cheeky Baby Butter goes above and beyond diaper duty by soothing dry skin and providing exceptional healing for eczema and red patches. A teeny bit of this cream goes a long way, and it may also be used by mamas for wrinkles, scars and stretchmarks. Erbaviva Diaper Cream had a spot on our Green Holiday Gifts for New Parents List, and it’s truly the gift that keeps on giving year round. 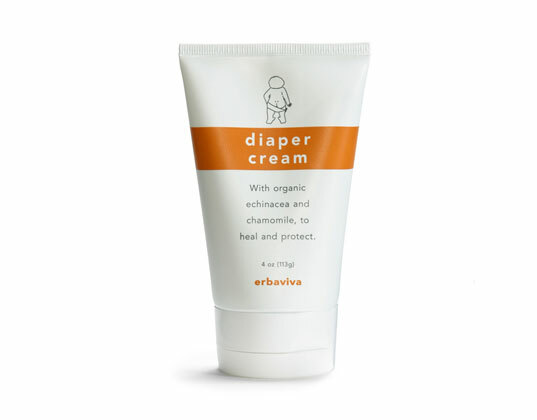 Featuring Echinacea as a main ingredient — which is known for its healing properties and ability to reduce redness, inflammation and pain — Erbaviva diaper cream is scented with lavender and chamomile essential oils to help soothe baby during a diaper change. California Baby products are a favorite of the Inhabitots editors. Their Calming Diaper Rash Cream, which contains an essential oil blend including French lavender and organic Tea Tree oil, as well as healing ingredients such as Aloe Vera and Vitamin E, not only soothes baby’s bottom, it may also be applied as a natural remedy for minor cuts and burns. The ingredients in this cream also work together to act as a barrier to prevent future diaper rash outbreaks. If you’re one of the lucky ones, and your sweet babe doesn’t suffer from diaper rash, you’ll still be thrilled to have L’occitane’s Shea Butter Mom and Baby Balm on hand — literally. We all know the amount of hand-washing that goes along with diaper changes, and this rich and creamy balm (which doesn’t leave hands with a greasy residue) is based on an ancient tradition of African mothers massaging their babies with “magical” Shea Butter to welcome them to the world. The purest blend of all natural ingredients including calendula, oats, and grape vine add up to make this Mom and Baby Balm a treasured tin. Some of these products have lavendar oil. I thought that was something we were supposed to be avoiding. J-Tree Salve (http://www.jtreelife.com/) works great on my daughter's bum. And its great for most other skin healing as well. Thanks e-lah. I was looking for a source to post, but couldn't find anything as official sounding as that NIH summary. what about the WELEDA products? any opinion against them? There's nothing particularly pleasant about diaper duty -- no matter how cute your baby's little bottom is... but these all natural diaper creams sweeten the ordeal with their healing, therapeutic properties -- and their ability to reach far beyond the changing table to provide nourishment and tender loving care to babies and the entire family. Read after the jump to learn about our top 5 picks for the best all natural diaper creams!